Many conflicting theories exist for what has become the symbol of Judaism around the world. When I started to research the origin of the Jewish Star or 'Magen David' as it is called in Hebrew (literally 'shield of David'), I realized how many conflicting views there were on its origin and discovered some interesting theories. The 'David' referred to is believed to be King David, originating from the tribe of Judah, who ruled ancient Israel and was famed for his skills as a warrior and for the biblical episode of 'David and Goliath'. Many hold the view that the six pointed star originated from the shield of King David, perhaps reminiscent of the shape of the shield or as an emblem upon it. However, historical sources dispute this claim and the star does not appear in any early Jewish literature or artwork. The menorah (candelabra) seems historically to have been more prevalent as a symbol. There is evidence that what is known today as the Star of David was used in the Middle East and North Africa as a good luck symbol. If we set aside the origins of the Star of David there is still plenty of intrigue relating to the emblem itself. Theological students have mulled over the symbolism of the two stars and various theories abound as to its meaning. According to Kabbalah (Jewish mysticism), the six points of the star symbolize G-d's rule over the universe in all six directions: north, south, east, west, up and down. In particular, many dwell on the upward and downward directions of the two stars, symbolizing heaven and earth. It has also been written that the opposition of the two triangles is significant - perhaps representing fire and water or good and bad. 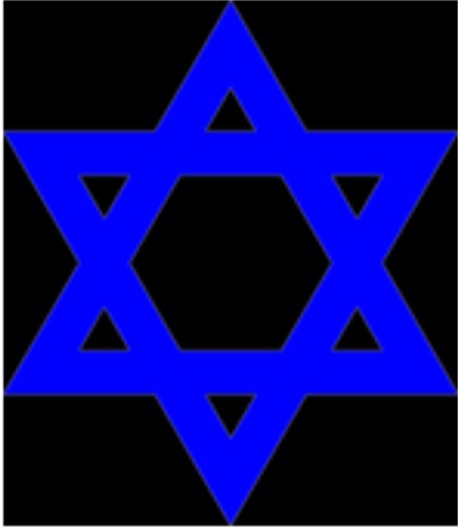 Some consider the fact that the two stars are intertwined may represent the ongoing bond of the Jewish people. The two stars have a total of twelve sides (inside and out) so this has been equated to the twelve tribes of Israel, which King David unified. There is some documented usage in Jewish artwork, synagogues, gravestones and religious artifacts but it is not until the 12th century that literary recordings exist. The Star of David was officially adopted by the Zionist movement as their emblem in 1897. The Jewish star has both happy and sad connotations - it was used to label Jews during the Holocaust, intending to humiliate them. However, in recent times it has become a source of great pride as the accepted symbol of Judaism and as the center piece on the flag of Israel, the Jewish state. The author of this article researched the origins of the Star of David during the development of a range of Judaic themed home-ware which used the image of the Star of David.